A super fast and easy pasta dish with the flavors of Thailand (psst: it’s also vegan)! This delicious pasta dish is so quick and easy to make, giving you delicious Thai flavor in minutes! You basically just throw everything in a pot and let it simmer till it’s done! + It’s healthy and vegan! As Thai food is one of my favorite cuisines, I of course love the flavor of the national dish Pad Thai. Delicious rice noodles, stir-fried eggs, chicken and shrimp, firm tofu, tangy tamarind, fragrant garlic, salty fish sauce and of course roasted peanuts. It is so tasty and with all the different textures and flavors, every bite you take just tastes a little bit different. After my month of following a ketogenic diet which was quite loaded with animal products, I was really craving some green, healthy, vegetarian and vegan dishes. That’s why I wanted to make this dish vegan: I skipped the egg, chicken and shrimp, while keeping the tofu. Okay, I still use fish sauce, which is technically not vegan. Either make your own vegan fish sauce (google: ‘vegan fish sauce’ for recipes) or substitute with 1 more tablespoon of soy sauce. The most awesome part of this dish is however that it’s a one-pot recipe. As you are using an exact amount of water for your pasta you don’t have to drain the pasta afterwards, because all the water gets absorbed. You basically thrown everything into a pot – voilà – dinner is done! This means it’s super easy to make and you have barely any dishes to wash afterwards. I have tried several one-pot pasta dishes last year and found its way better to use a skillet with high rim, rather than an actual pot. Also, spaghetti works a lot easier for one-pot dishes than rice noodles… Try it, perfectly al dente pasta every single time! Throw away that ’30 minute meals’ book from Jamie Oliver and run to the kitchen. Start now and dinner will be served in exactly 25 minutes! 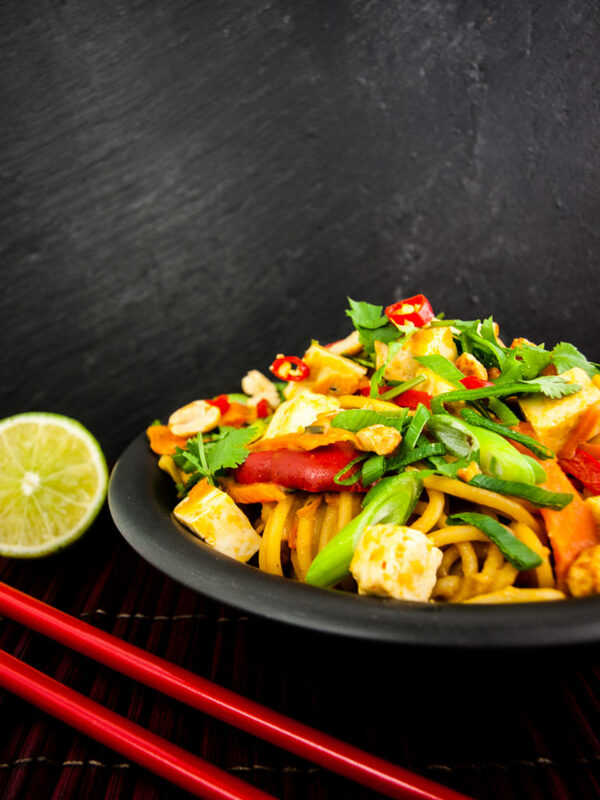 Put 25 minutes on the clock: Get ready – set – cook Thai noodles! Very finely dice the garlic and ginger. Slice both the spring onions and red pepper into fine rings. Cut the carrot into julienne (that’s the fancy French culinary term for match sticks) and the bell pepper into strips. Crush the peanuts. Pour 600ml warm water into a big skillet with high rim. Stir in peanut butter, fish sauce, ketjap manis, chicken stock, garlic, ginger, spring onions, chili pepper and half the crushed peanuts. Add the spaghetti (if your skillet is too small, break the pasta in half), carrot and bell pepper. Bring to the boil while stirring carefully. Reduce heat and simmer on low heat for 15 minutes with the lid off. Stir occasionally to make sure the peanut sauce does not catch at the bottom of the skillet. If the sauce gets to dry and catches at the bottom of the pan, stir in another 50ml of water. While the pasta cooks, cut the tofu into 2cm cubes and chop the cilantro. After 15 minutes, add the tofu, cilantro and lime juice, stir to combine and simmer for another 5 minutes until most water is absorbed and tofu is warmed through. Garnish the noodles with some more sliced spring onions, cilantro and the remaining crushed peanuts! Have you ever made one-pot pasta before, and if so, what is your experience? What do you think of this very Western take on Pad Thai flavors? I know that this recipe is clearly not an authentic Pad Thai recipe. You can read here all the things I’m doing wrong. Still, I’m more than curious what you think about it. Let us know in the comments!